Yeah they did do an all black BB figure, but the sculpt was still the same, all bulky and ripped. The Batman Beyond line from Hasbro was completely off in style from the show. Thats why I hope Mattel do start making BB characters that were in JLU as they would get the look right. It was a huge improvement over the initial clear-blue version, but still off-model. 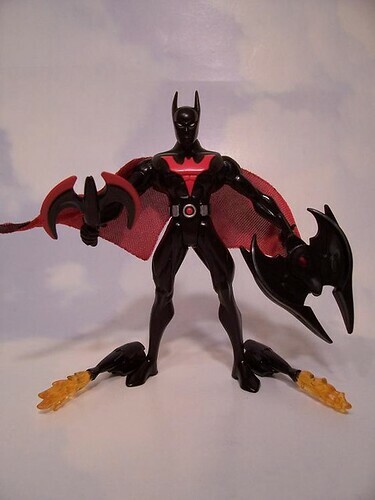 I love every single one of my Batman Beyond figures, but i'd love for Mattel to take a crack at a JLU verison. This line was always bigger than the cartoon it came from. Maybe "bigger" for you, but that's a pretty misleading statement. If Mattel's sales were anywhere near the show's ratings, we wouldn't even be having this discussion, as they'd have been rushing to crank out every character DC would approve. Polls wouldn't even be necessary. To me, the storytelling and character designs from the DCAU are far more important than the plastic. Besides, when the line began, it consisted of seven characters. Anyway, for my money, the thirst for characters from the DCU is better quenched by DC Direct's offering than from this line. On the other hand, DCD's Question wouldn't satisfy my desire for an animated style figure. I wasn't trying to be misleading, nor was I implying the line was more popular than the cartoon. I simply meant that from the time Mattel started reaching into the background characters, even they were using the show as a de facto DCU line, not just a line based on a cartoon. Or else characters like Dr. Light and Obsidian and Nemesis wouldn't have been made. Come on, you don't think they weren't produced because they were in any way important to the show, do ya? And everyone has a different opinion on which line they prefer. For MY money, I don't like 6" toys and am not going to begin a new 6" line. When JLU dies, so does my interest in DC toys. Again, just opinions. Well, that's too bad that you voted that way, because the poll was set up the way it was due to Scott's comments on the line. JLU the show would be 'finished' first, and then they'd branch out to the DCU in that style possibly in later 2009. "Too bad?" Why is that "too bad for (me)"? I've ALWAYS voted in polls based on which DCU characters I most wanted, not based on which were more important to the show. I didn't know there was some other unspoken requirement, or that I'd possibly someday be told it was "too bad for (me)" that I voted how I wanted to within the rules of the poll. Geez, you guys made the poll and said I could vote for anyone so long as they were on the show, then question when people choose folks you don't think were important to the series. If that was the real question you wanted to ask, then why didn't you just ask it: "vote for the figures you think were most important to the show." Sorry I didn't understand the implied rules of this game. So, as far as what they're working on now, it's all JLU-related, with development for the future (I believe "second half of 2009" was the quote) to slowly branch out into the DCU in animated style. I know that, and I also know that, according to this answer at the Fwoosh, they're already working on Fall 2009 for the DCUC line. So it's not a stretch to think they're planning the Fall 2009 JLU line as well, right? Forgive me for thinking that last question about where we wanted the line to go was a real one. Seems I'm just doing stinkin' thinkin', and need to get back into the mindset required here at AFI -- "who was more important in regards to the cancelled JLU cartoon -- Tala or Amanda Waller?" I won't make that mistake again.